An absolute must for history buffs, London's Imperial War Museum endeavours to give visitors an understanding of modern warfare, and an appreciation of its effects on both individuals and societies at large. The Imperial War Museum is, in fact, a 'family' of five museums, three of which are located in London. 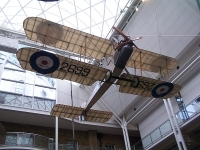 The flagship museum is found in Lambeth Road in south London, and features a unique collection of art, films, photographs, sound recordings, writings and objects that preserve the reactions and memories of Britons who have lived through wartime conditions. The Churchill War Rooms, located in King Charles Street, form another fascinating branch of the Imperial War Museum. These bunkers housed the British heads of state during the Blitz, and today offer visitors a truly incredible trip back in time, where they can navigate the underground mazes and view charts and maps that haven't been touched since 1945. The last of the Imperial War Museum branches in London is the HMS Belfast, a warship that is moored in the Thames. Tours of the HMS Belfast take in the gun turrets, the mess decks and the clamorous bowels of the ship, and provide an exciting and educational experience that will be appreciated by visitors of all ages. A highly recommended sight, all three London branches of the Imperial War Museum can be visited in a day.